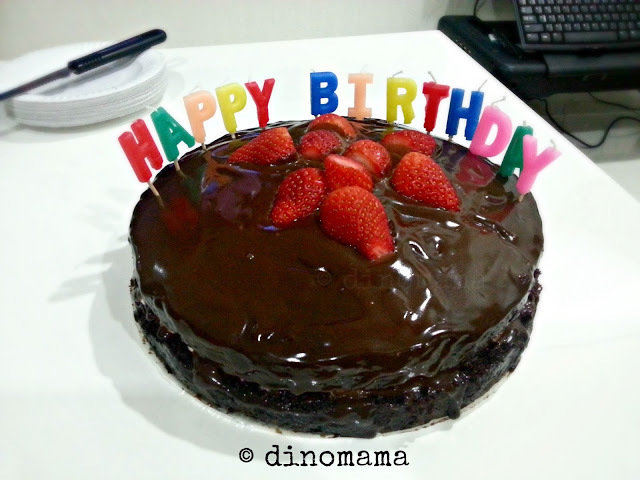 When I asked DinoBoy days before his birthday if he wants me to bake a birthday cake for him, I got an immediate "YES!" 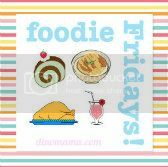 reply follow by "But I want a cake with decorations, not those that you baked before ok? ", of course I wasn't going to give him a loaf birthday cake. Having said that, I actually have no idea what kind of cake to bake, I was thinking of chocolate cake but do not know which recipe to use. Then my friend Rachael Holloway saved my day when she shared a photo of the chocolate cake she baked for her girl. The most wonderful part is she posted the recipe almost immediately knowing that I will be interested. Talk about like-minded friends! I sure would have hugged and kissed her if she is not all the way down under in Australia! So a few days later on a Sunday I started my quest to bake my first Birthday Cake for DinoBoy. 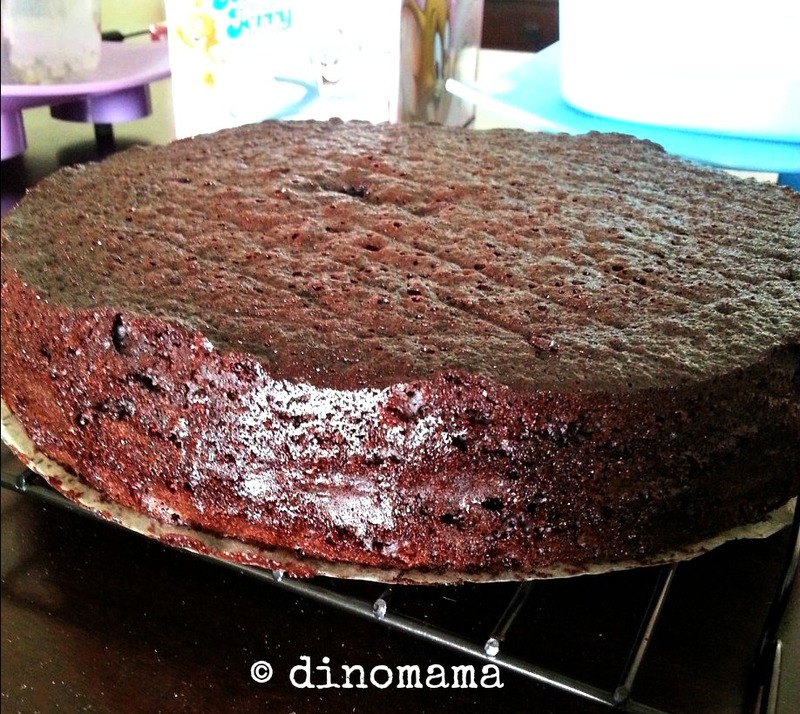 There were some hiccups though; (1) I used a flat metal spatula that was meant for spreading cream to slice the cake, I MUST remember to get a long serrated knife from Phoon Huat soon! (2) I over whipped the cream twice and it turned into butter, I have to remind myself not to get too excited with my handheld mixer on the 3rd try. Nevertheless, I was beaming with pride when the cake was done. And now, let me show you the baking process of my first birthday cake. I got too excited when I saw that my cake has rise up beautifully that I poked the cake too hard to check if the cake is fully cooked thus a big hole in the middle of the cake. The cake is not thick enough for me to slice it into half nicely, I had to be very careful to ensure that I slice it in a straight line. I managed to did a good job but the slices were just too thin, I almost break the top slice when I was removing it. 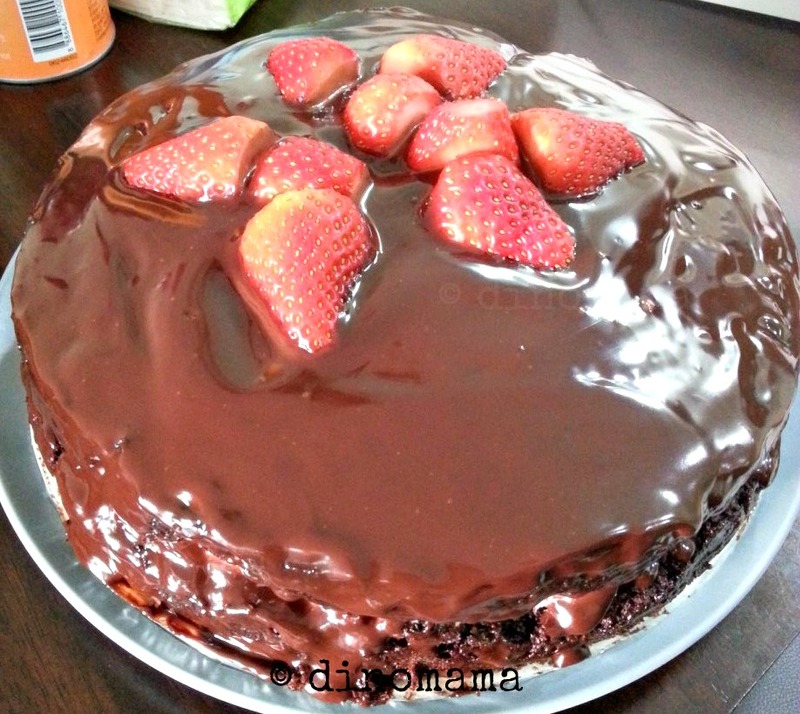 DinoPapa helped me diced the strawberries while I take a breather, baking a cake is REALLY hard work! After the cake has cooled down, I slapped on the strawberry filling generously. I managed to tear the top slice when I was putting it back onto the cake, I was expecting it so was not upset about it. Anyway, no one will see the tear with the chocolate ganache covering the cake. I had wanted to pour the whole ganache onto the cake but decided against it, I was afraid that some will find it too rich for their liking. I did a simple deco with some left over strawberries and popped the cake back into the fridge for the ganache to set and harden up. Here is the cake after sitting in the fridge for 2 hours, it does not look as pretty and nice like those displayed in the bakery but I think I did a good enough job. And as Rachael & the rest of the gang said "pretty or not doesn't matter to me after all it goes into my tummy with full satisfaction." Well said gang! The verdict from the family members? If you prefer to have your chocolate cake with cream cheese frosting, you can check out Bisous A Toi version. 3. 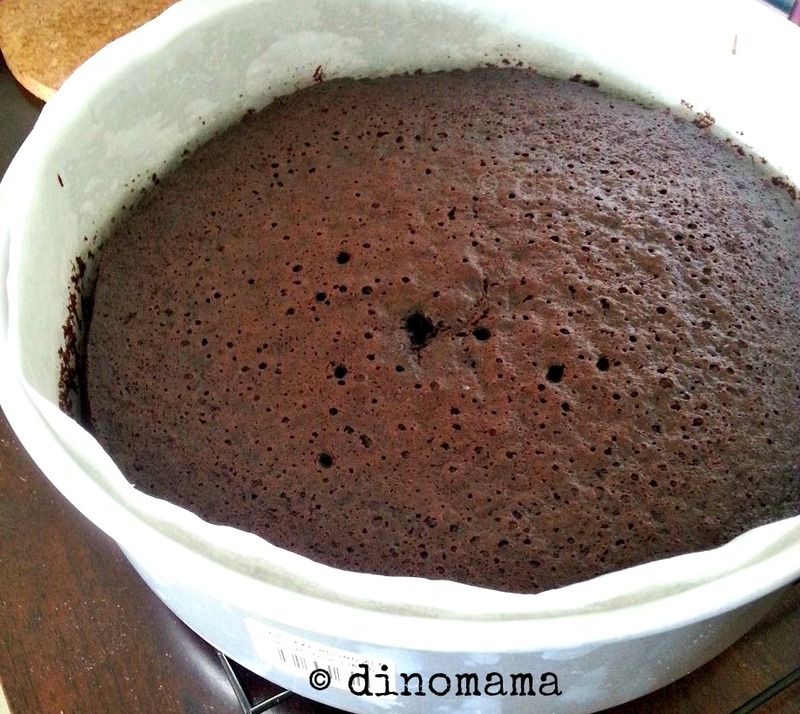 Sieve flour, cocoa powder, bicarbonate soda, salt, and set aside. 4. Beat butter with sugars until light and fluffy, add egg and mix well. 5. Add dry ingredients alternately with liquids using one third of each at a time, and mixing well between each add. 8. 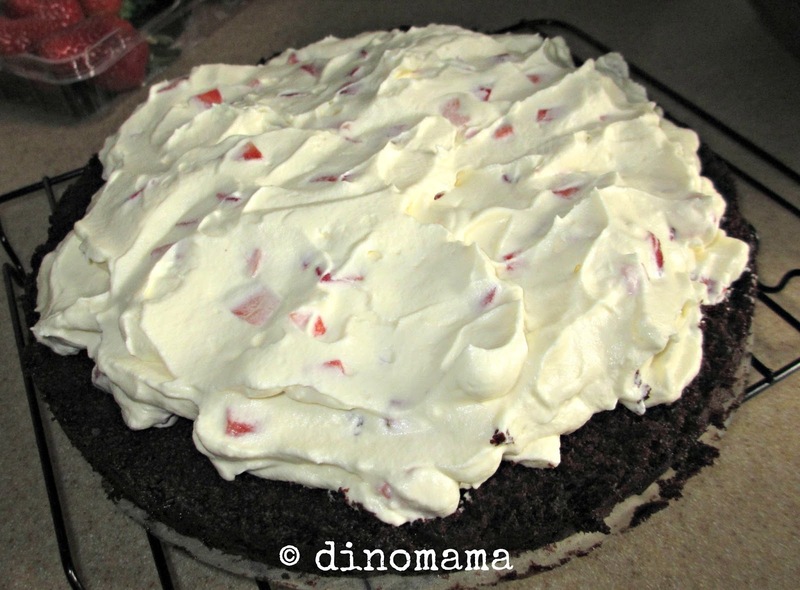 While the cake is baking, whip the heavy cream till stiff and stir in the strawberries. Put into the fridge to chill for use later. 9. Melt the chocolates and cream together using the hot water bath method. Set it aside to cool and thicken. oooohhhhh i love anything choc! am so gonna bake it. and btw the finished product looks very very nice! Nerdymum, thanks for the compliment hehehe~ You try to bake it and tell me if you like it or you like it A LOT.